I stumbled onto something the other day that I wanted to share. As readers and writers, we have a vested interest in the sharing of books. Sharing books ultimately sells more books and more books sold means more books published. Win win! Unfortunately, sharing books has become embroiled in the ebook revolution. Libraries are facing declining numbers of users and declining funds. Ebook lending is struggling to create universally accepted and beneficial parameters, leading readers to buy digital and not pass along the books they love. Boo! What can we do to keep the sharing alive? This. This is a “little free library.” It sprouts without pomp or circumstance from the grass between two front lawns in a neighborhood not far from my house. It’s hard to tell whose handy work it is. There are no identifying markings. The only directive is what you see…Leave a Book. Take a Book. Good God, it makes me cry. Imagine my emotional response when I did a little research and discovered this is part of a movement. 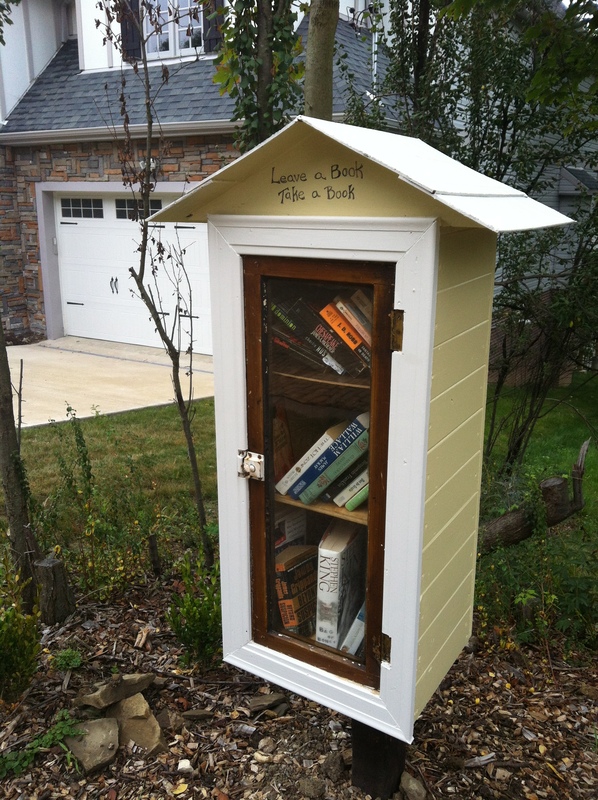 Little libraries like this are popping up all over America. Couldn’t your neighborhood use one? To find out more, visit Little Free Library online. Did you know about this or stumble onto a little free library in your neck of the woods? I’d love to know. Share your comments below. What did I crave? 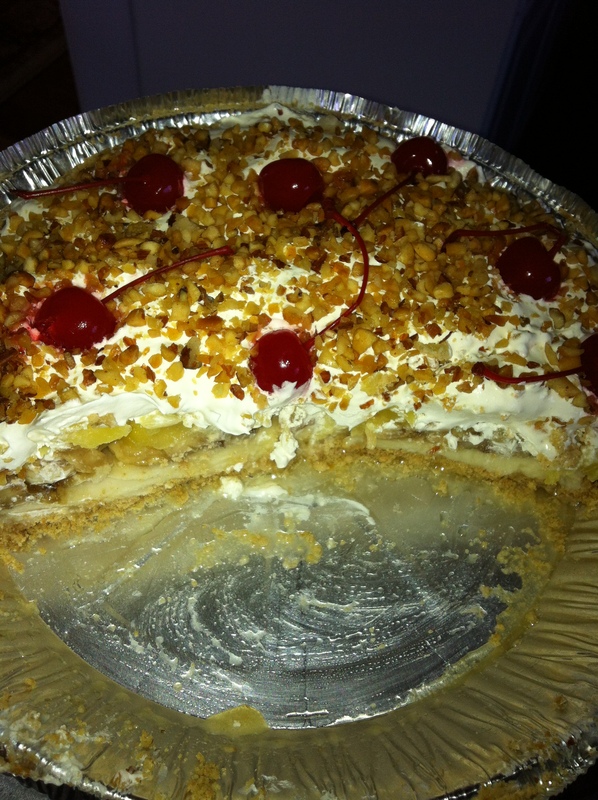 A banana split pie with graham cracker crust, creamy center, bananas, pineapples, whipped cream, nuts and cherries. What does this have to do with writing? More than you might think. The piece of paper containing the recipe for banana split pie is more than thirty years old. The paper and the handwriting belonged to my neighbor, Giselle. She made this pie every picnic of my early childhood. When I look at this paper, when I make this pie, I think of Giselle, who died decades ago, and I think of the neighborhood I left behind almost as long ago. But it’s not just Giselle’s writing on the yellowed page, another person made her mark. My mother took notes throughout the years on ways to make the recipe low-fat, low-sugar and safer (no raw eggs!). These notes bring back even more memories. The reason the recipe was modified to low-sugar was because my father was diagnosed with Type 1 diabetes in his late thirties. One look at her notes, and I remember the hospital stay and the fear in my heart. Even a recipe has a story to tell. I’m going to do something today that I will most likely never do again. I’m going to share a recipe with you. I wish I could write it down and mail it, because something gets lost in the translation from handwritten to computer printed. Keep that in mind the next time a good friend asks for a recipe. Write it down. You don’t have to be writing an article or a 100,000-word piece of fiction to have an impact on a life. Blend together until smooth and place in 9×13 glass dish or pan. ***Note from my mother: Giselle’s recipe does not call for baking, however, I always bake mine for about 4 min. at 325 or 350 degrees and watch closely so it does not burn. ***Note from my mother: Giselle’s recipe says to add a raw egg, and I never, never would! Instead, I add about 1-2 Tbsp. milk. Cover with large cool whip and add chopped nuts and maraschino cherries.